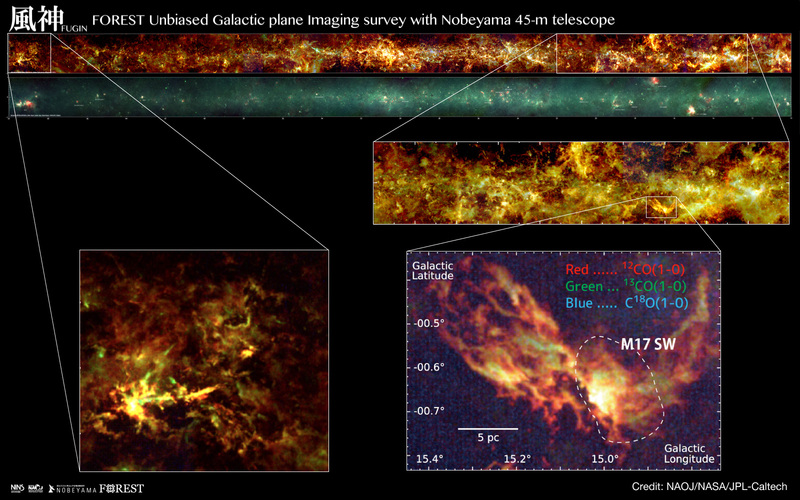 The The FUGIN (FOREST Unbiased Galactic plane Imaging survey with the Nobeyama 45-m telescope) project is one of the legacy projects utilizing the new multi-beam receiver FOREST (FOur-beam REceiver System on the 45 m Telescope). This project aims at investigating the distribution, kinematics, and physical properties of both diffuse and dense molecular gases in the Galaxy observed in the 12CO, 13CO, and C18O J = 1-0 lines simultaneously. The mapping area extends over a large parts in the first quadrant (10° <= l <= 50°, |b| <= 1°) and the third quadrant (198° <= l <= 236°, |b| <= 1°) of the Galactic plane, which include spiral arms, the bar structure, and the molecular ring of the Milky Way. FUGIN provides us the highest angular resolution data to date (~20") among the existing Galactic plane CO surveys. The high quality data enable us to study Galactic interstellar medium (ISM) in wide aspects from galactic-scale structures to dense molecular filaments/clumps/cores, and their evolution and star formation. The archival dataset is available for all astronomers worldwide. Copyright © 2018 FUGIN. All Rights Reserved.